Technology has made creating valuable content is easy, breezy and, yeah, there’s that word again – fun! Remember those toys that you might have had from your childhood, like a novelty printing press or fill-in-paints? Those kinds of intuitive creative products have made their way into the digital world, and as a result, the internet has made marketing an, easy creative activity for all of us. People who don’t even own businesses are marketing themselves, and if anybody can market themselves and have fun doing it, then so can a business. Businesses everywhere are discovering this, and the lesson is simple: have fun what you’re doing, and it will succeed. If you enjoy it, the audience will, too. Understanding the power of branding is an important aspect of marketing. It can be as powerful or as weak as you want it to be, and in turn it can make or break your product or service. Part of the key to branding is knowing what you want, and don’t want to associate with it. Photos are a great tool for quickly carving out or brand image. After all, most of us have smartphones, and we use them largely for taking photos. That’s where Brandr comes in. Brandr is the easiest way to turn your smartphone into a branded content-generating device. It lets you add your own brand info, like text and overlays to the pictures you’ve taken, then quickly share them on social media. You’ll be producing more image-based content than ever, now that you’ve got an app at your fingertips that streamlines a large part of this process. Many people are talking about Brandr and when you use it, it’s pretty easy to see why. Wanna create your own commercials? Try Flipagram. Flipagram is a social networking app that lets you take your videos and photos to all sorts of fun places. You can create short ‘photo-video’ stories compiled from pictures, video and music, then share it with your friends. It’s got a bit of Instragram, a bit of Snapchat, and a bit of Youtube all rolled into one. The first time you see Flipagram’s logo, you might be reminded of Youtube’s similar red/white ‘Play’ symbol. Really, the whole Flipagram concept is very reminiscent of Youtube back in the old, pre-Google ‘Broadcast Yourself’ days – basically, a big fun hub of people playing around with their cameras. No production values, no marketing or corporate presence, just simple homebrew content. There was something just a bit more personal and intimate than what we see today. But hey, everything changes, right? So Flipagram offers you a fun way of connecting with audiences on a personal level. The beauty is in its childlike quality – something we’ve always wanted to do since we grappled with our first computer on Windows Movie Maker. Easily make your own videos! Flipagram doesn’t expect the world from you, only to share, create, and have fun. Turns out, creating those kinds of graphics takes no time at all with a tool like Canva. Canva’s slogan is ‘amazingly simple graphics design’, and ‘simple’ doesn’t get any simpler than this. You can use Canvas to easily create social media and blog graphics, posters, e-mail headers, thank you cards, e-book covers, album covers, desktop wallpapers, postcards, ads, brochures, infographics and even restaurant menus. Choose from a range of text fonts, graphics, backgrounds, frames, shapes, icons and charts to help create your perfect image for literally anything. It also lets you create graphics tailored towards specific social media platforms, like Facebook, Twitter, Instagram and Linkedin. Canva can truly ‘supercharge’ your marketing strategy. When you’re producing content prolifically, it’s easy to forget to add the nice finishing touches, with graphics, pictures and more. Canva is like your personal assistant, making that incredibly easy and hassle free. A solid alternative to Canva is Fotor, in that it basically offers the same thing, but each side has its strengths and weakness. Fotor’s overwhelming array of design choices are an attraction for some, and a turn-off for others. Check out this comparison article which might help you decide which one is right for you. Want to create beautiful looking e-mails? Tired of marketing yourself out but looking more like a spam hoax message from Nigerian royalty rather than a legitimate organization? MailChimp takes the simplicity and potential of Canva and focuses in on e-mail design. Whether you’re designing newsletters, flyers, announcements or RSVPs. Business-related or not, it has many uses. The great thing about MailChimp is that unlike Canva, which can overwhelm you with so many options, this really hones in on the e-mail side, allowing you to really focus on your e-mail marketing strategy, as well as giving you new motivation and inspiration to actually do an e-mail strategy in the first place. With software this simple, why not? Come on, you can’t judge us for putting Instagram on this list, right? Gotta pay homage to the classics! Really, Instagram is a powerful tool for marketing through a simple platform – sharing photos with comments and hashtags. It has worked with the ever-advancing field of smartphone towards an ‘anyone can be a photographer’ future. It shows, possibly more than any of these other entries, just how easy and fun marketing can be. Companies have gone global through simple, yet effective marketing strategies on Instagram, and it can do that for you too. Instagram takes the hierarchy out of the corporate-consumer relationship and allows us to realize that these companies are comprised of nothing but people, and the only way they can sell their products is by creating lasting, effective relationships with social media communities. This has resulted in a torrent of amazing, creative and exciting ideas, and plenty more to come. Snapchat is slowly but surely becoming a solid place to sell and market products and services, and given its reputation you can’t blame businesses for being reluctant or unwilling to see the potential. But you only have to look at the results. Take the story of Perfection Chocolates. In an interview with Social Media Marketing podcast, owner John Kapos said Snapchat ‘made Perfection Chocolates a global brand,’ by taking the small Sydney business from ‘just another chocolate shop’ to a hub for chocolate lovers worldwide to travel and share their choc-related stories. The Kapos family was in the business not for money, but the love of chocolate. And through Snapchat they can show it. All in all, Snapchat really puts the ‘fun’ into the title of this blog post. The appeal of marketing via Snapchat is to show a more personal side of you and your business, and also having so much fun in the process that you don’t even feel like you’re working. In the end, that benefits everyone. 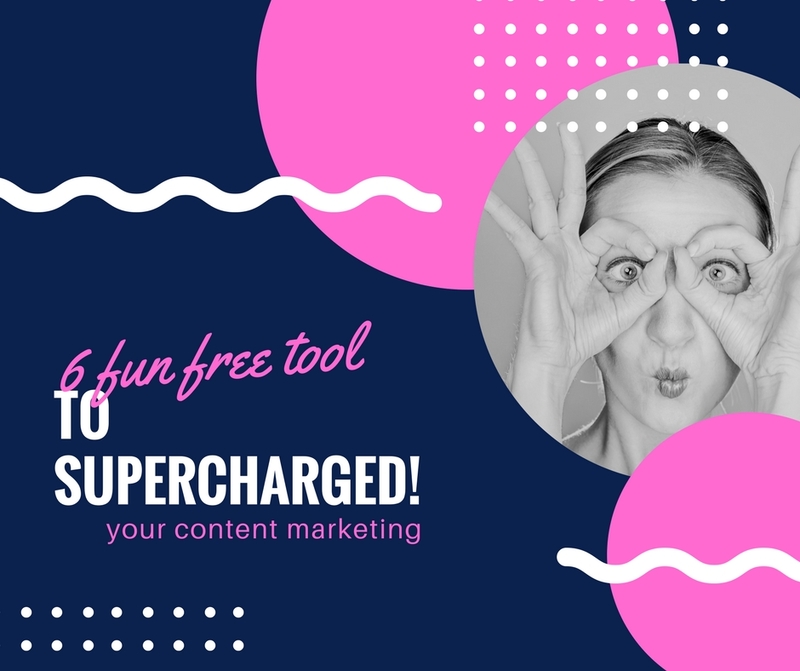 So here we’ve told you about 6 tools that can help make your content marketing a little bit easier, and a bit more fun. But there’s plenty more out there for you to discover. Have you got an app that helps make your content marketing a blast? Let us know in the comment section – we love to hear all your ideas and experiences.